I recently came across this fantastic excerpt written by Lyme researcher and lecturer, Thomas Grier, M.S., who was misdiagnosed with MS for years when in fact; he had chronic relapsing Lyme disease. Sounds familiar to many of us, I know. He is now the Executive Director of Pathology Studies at MIBDEC (Minnesota Insect-Borne Disease Education Counsel), a non-profit organization. He has a background in microbiology and immunology and continues to do research in both the Lyme and MS communities. The article is so long that I'm breaking it into parts and using excepts that might not be as well known or understood. I personally found it extremely interesting and while I already knew some of the basic information; it truly helped me to better understand the complexities of Borrelia (Bb) and it's effect on and within the human body. I felt the need share it. Perhaps some of you are familiar with Grier and/or his work. I had previously read his personal story a couple years ago but never knew he had written the manual (Lyme Disease Survival Manual) this excerpt is taken from. Why is Lyme disease such a mystery? Why does it mimic so many other diseases? Why is it so difficult to detect? The reasons come from the microbiology of the bacteria that causes Lyme. This paper will look at the biology of this bacteria and the consequences of the organism’s unique microbiology on human victims. Lyme disease is caused by a spiral shaped bacterium known as a spirochete. Diseases that are caused by spirochetes are notorious for being relapsing in nature, difficult to detect, and great imitators of other diseases. Syphilis, Tick-Borne Relapsing Fever, and Leptospirosis are other examples of spirochetal diseases. Lyme disease is caused by a bacteria called Borrelia burgdorferi, named after the man who isolated it from a Deer Tick in 1981, Dr. Willy Burgdorfer. The following is a tutorial to help explain away the mysteries of this bacteria, and why it causes so much controversy between patients and the medical community. The structure of the Lyme spirochete is unlike any other bacteria that has ever been studied before. It is one of the largest of the spirochetes (0.25 microns x 50 microns). It is as long as a fine human hair is thick. 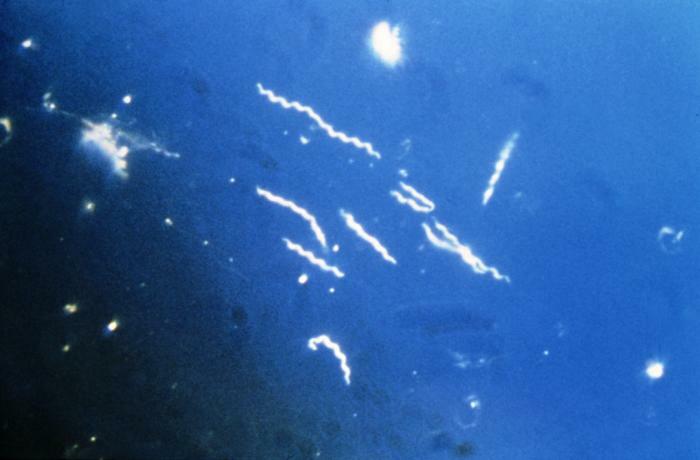 Borrelia burgdorferi is a highly motile bacteria. It can swim extremely efficiently through both blood and tissue because of internal propulsion. It's propelled by an internal arrangement of flagella, bundled together, that runs the length of the bacteria from tip to tip. Like other Borrelia bacteria, Borrelia burgdorferi (Bb) has a three layer cell wall which helps determine the spiral shape of the bacteria. What makes this bacteria different from other species is that it also has a clear gel-like coat of glyco-proteins which surround the bacteria. This extra layer is sometimes called the Slime Layer or S-layer. This means: This extra layer of glyco-proteins (exaggerated in thickness here) may act like a stealthy coat of armor that protects and hides the bacteria from the immune system. The human immune system uses proteins that are on the surface of the bacteria as markers, and sends attacking antibodies and killer T-cells to those markers called outer surface protein antigens (OSP antigens). This nearly invisible layer is rarely seen in washed cultures but can be seen regularly in tissue biopsies. The Lyme bacteria is also different from other bacteria in its arrangement of DNA. Most bacteria have distinct chromosomes that are found floating around inside the cytoplasm. When the bacteria starts to divide it forms a new cell wall in the middle and begins to split in two. The chromosomes also divide and the new copies of the chromosomes enter the new cell. The arrangement of DNA within Borrelia burgdorferi however; is radically different from other bacteria. It is arranged along the inside of the inner membrane of the cell. It looks something like a net embedded just underneath the skin of the bacteria. This means: We really don’t understand the mechanisms of how Bb regulates its genetic material during its division. The bacterial DNA is uniformly embedded inside the inner membrane of the Bb bacteria like nylon stocking. Another unique feature to Borrelia burgdorferi are Blebs. This bacteria replicates specific genes and inserts them into its own cell wall and then pinches off that part of its cell membrane and sends the Bleb into the host. Why it does this we don’t know? But we do know that these blebs can irritate our immune system. Dr. Claude Garon of Rocky Mountain Laboratories has shown that there is a precise mechanism that regulates the ratio of the different types of blebs that are shed. In other bacteria the appearance of blebs often means the bacteria can share genetic information between themselves. We don’t know if this is possible with Borrelia species. The division time of Borrelia burgdorferi is very long. Most other pathogens such as Streptococcus or Staphylococcus, only take 20 minutes to double. The doubling time of Borrelia burgdorferi is usually estimated to be 12-24 hours. Since most antibiotics are cell wall agent inhibitors, they can only kill bacteria when the bacteria begins to divide and form new cell walls. This means: Since most antibiotics can only kill bacteria when they are dividing, a slow doubling time means less lethal exposure to antibiotics. Most bacteria are killed in 10-14 days of antibiotic. To get the same amount of lethal exposure during new cell wall formation of a Lyme spirochete, the antibiotic would have to be present 24 hours a day for 1 year and six months! If a bacteria is in a non-metabolic state (dormant) no antibiotic is effective. To be lethal the antibiotic must be absorbed and processed through the bacteria’s metabolic machinery and cause a disruption of metabolism. Unlike antiseptics, antibiotics don’t kill on contact. If there are any dormant bacteria hidden in sequestered sites, then regardless of the length of treatment, antibiotics can fail until the bacteria become metabolically active (The Forgotten Plague see reference to Tuberculosis). Like other spirochetes, such as those that cause Syphilis, the Lyme spirochete can remain in the human body for years in a non-metabolic state. We know this because patients with ACA rash for years are often culture positive when the skin is biopsied and cultured. Non-metabolic bacteria is essentially suspended animation. The bacteria does not metabolize in this state. Antibiotics are not absorbed or effective. When the conditions are right, those bacteria that survive can seed back into the blood stream and initiate a relapse. It is a beautiful and patient survival mechanism. This means: Just because a person is symptom free for long lengths of time doesn't mean they aren't infected. It may simply be a matter of time before the re-emergence of the sequestered non-metabolic bacteria. Whereas viral infections often impart a lifelong immunity and may suppress subsequent relapses or reinfections, Lyme, like other bacterial infections, does not impart an active immunity for a long period of time. People are often reinfected with Lyme. A relapse of symptoms could actually be thought of as a reinfection or a reseeding of infection from immune privileged sites. The Lyme spirochete has a sequence of surface antigens it can choose to express or not express. There are more than two dozen species of Relapsing Fever Borrelia bacteria which have been clearly identified. We are now beginning to see a similar diversity within the Lyme spirochete family as well. Polymorphism, which is the ability of the bacteria to change it's structural identity, makes recognition and identification more difficult. It is like a criminal putting on a new disguise after every time he has committed a new crime. While there are four generally accepted genospecies of Lyme disease - Borrelia burgdorferi, Borrelia afzellii, Borrelia garinii, and Borrelia lonstarrii - there are hundreds of identified strains of the first three species. Borrelia spirochetes are polymorphic because they have built in genetic mechanisms to vary their antigens. This means: Just as the immune system recognizes the bacteria and tries to kill it; the bacteria changes its clothes and fools the immune system and survives a little longer. Soon the bacteria finds safer areas of the body to hide in and the immune system stops looking for it. But another aspect of polymorphism is that once the cell changes, it may become even more lethal to some cells. For example, when Borrelia burgdorferi was introduced into the mouse via the blood stream, the bacteria traveled to the brain. But the bacteria recovered from the brain was more adapted to the brain and could no longer be killed from antibodies in the bloodstream. Polymorphism is a clever way to survive and may offer reasons for multiple symptoms. Wow, Michelle. What a great article and break down. Thanks for posting; I had never heard of Grier.